The dog eventually strolls away from the woman in the direction of a group of teenagers sitting a classroom table. The woman, Cindy Pharis, breaks away from her desk and retrieves her wire-haired Dachshund. 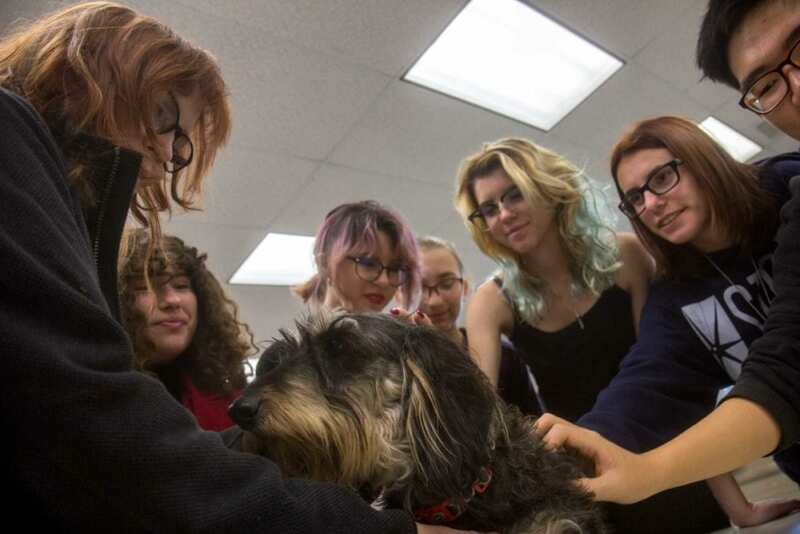 Pharis, an art instructor at Valencia High School, is protecting the dog, who coincidentally is one of her few remaining possessions. Just three days prior, the Creek Fire had robbed them of mementos in place of memories. “For some reason, I woke up at 4:17 a.m. and my windows were orange,” Pharis said. “I ran and looked out the front window and saw the whole hillside on fire.” Pharis pinpointed a pair of pants, purple shoes and Sketch. With car keys and a leash in hand, the woman feverishly opened the front door. She was greeted with hot honey-yellow embers and Mother Nature’s warm embrace – a cold-hearted hug from a calculatingly intense inferno. An endless convoy of glowing ash flakes pushed through the open entryway. Sketch retreated back into the house. In a tug-of-war struggle, Pharis wrestled the dog into her car. As she gripped the steering wheel, a flaming tidal wave stampeded down a hillside yards away. “I found a fire engine and told them my house was starting to burn,” Pharis recalled. “They said there was nothing more they could do to save it.” The fire department was already exhausting all resources in the dense forest community south of Santa Clarita. Hurried by a blooming orange glow, the woman anxiously continued south down Kagel Canyon Road toward safety. As fire surrounded a nearby cemetery, Pharis struggled to breathe. She was choking on the thick, smoky air. Pharis crossed paths with another fire engine. A bright red glimmer and the roar of a thousand trees snapping quickly enveloped the canyon around them. “We’re getting surrounded,” a fireman shouted to the woman. “Go that way and drive as fast as you can!” Blinded by smoke and tailed by radiant monstrous flames, the art instructor and her dog made a harrowing escape from their Kagel Canyon home of 18 years and disappeared into the nighttime darkness. “I got to the bottom of the hill and saw more more homes burning,” Pharis said. The woman came to the realization that the fire had shot across the canyon. Flames were actively dancing throughout all three sides of the woodland bowl. She drove away, the beaming inferno shrinking in size, eventually disappearing in her rearview mirror. Whether it was shock, trauma or subconscious instinct, she fled her safe haven and headed to her second home – Valencia High School. Thirty minutes later, Pharis flipped a switch and light flooded her classroom, three hours earlier than usual. She opened a web browser and checked her community Facebook group. It was there, on her computer screen Pharis learned her home’s fate. “A post said an L-shaped home had burned,” Pharis said. Her house was the only L-shaped structure on the street. Any remaining hope she had of her home standing was swiftly crushed after her children called to confirm the news. “The neighbors told me today it’s just ash and foundation,” Pharis said. A photo taken by a neighbor shows the charred wreckage of Cindy Pharis’ Kagel Canyon home. Among the charred wreckage is Pharis’ personal art studio. In it, all her paintings and sketchbooks she’s amassed since her college years and two invaluable photos of her children when they were newborns – all of it now ash and memories. “It’s a record of my life, all my poems and stories,” she said. “I had moccasins that were passed down from my Native American ancestors.” News of the destruction soon spread through her school community. Students, both current and former, staff and parents started a GoFundMe crowdfunding account, collected blankets and purchased a bed for Sketch. 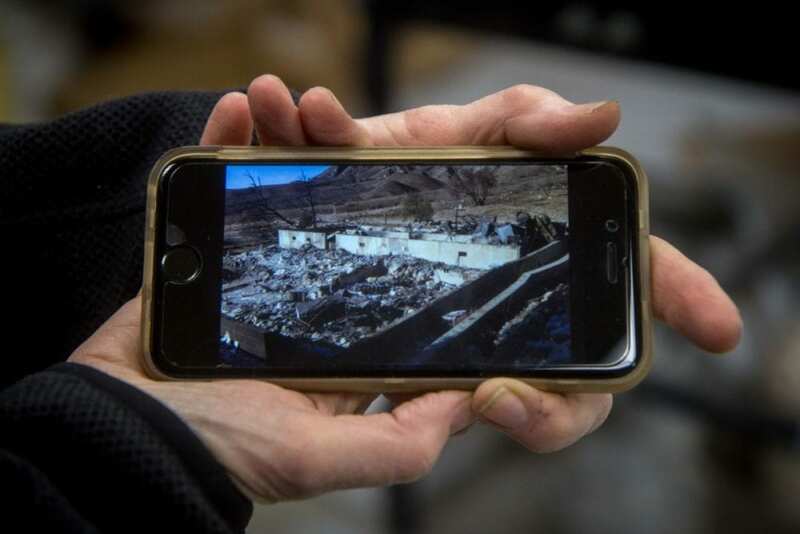 For Pharis, their generosity became a beacon of light, breaking through the Creek Fire’s dark billowing smoke, shining across the charred homes and bleak neighborhoods. The Valencia High School art instructor no longer felt alone. “It just brought tears to my eyes,” she said, noting she hadn’t shed a tear over her burned house. Pharis said the fundraiser will help her find a home, hopefully near Valencia High. “I might spend the night with friends, but I really don’t know what I’m going to do,” she said. 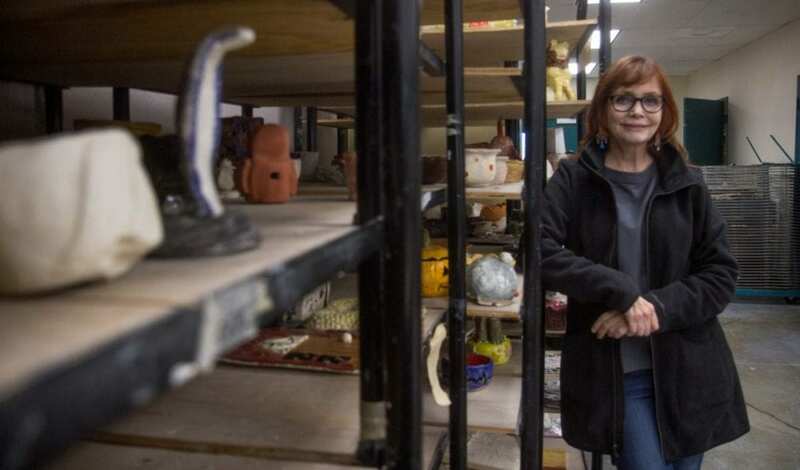 As of Friday afternoon, Pharis had not returned to her house – because she was sharing her passion for art with students at her classroom home. To donate to the GoFundMe set up to raise money for Pharis and Sketch, click here. [email protected] 661-287-5550 You can follow Austin Dave on Twitter and on Facebook.